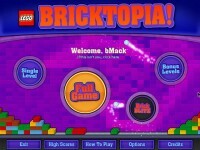 Combine classic arcade ball-and-paddle action with a brick stacking puzzle element and you've got LEGO Bricktopia! LEGO Bricktopia puts a brand new spin on a classic game, featuring over 160 animated levels of addictive ball-bouncing, brick- stacking action! Customize the shape of your paddle by catching and stacking LEGO bricks, then unleash the power of each LEGO brick to charge your shields. 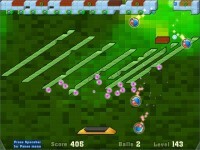 Grab one of 20 unique power-ups to give yourself a leg up! With kaleidoscopic visuals, loads of unlockable content and hours of addictive gameplay, LEGO Bricktopia will transport you to a world of fun! 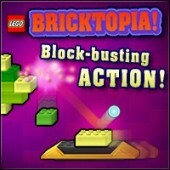 Tell someone about LEGO Bricktopia Game!